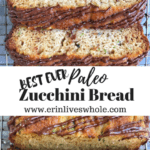 Healthy Paleo Zucchini Bread that is made with almond flour, coconut oil and is naturally sweetened with honey instead of sugar. Great for breakfast and is loaded with simple, healthy ingredients. Guys, working from home with a cute puppy is really a recipe for disaster. I feel like I no longer actually get anything accomplished because she has started to just sit next to me and stare until I agree to play with her. Whenever I’m at my parent’s house, they always ask if they should take her to daycare but if I’m home I hate to make her go in because, well, daycare costs money and she forces me to take a break from my computer. But it’s times like these when I’m trying to write up a simple post about paleo zucchini bread that I am reminded how hard it is to have a dog that needs a lot of attention and loving AND work from home. Right now we are in the heart of summer produce and that means one thing. Gardens are literally bursting with zucchini. 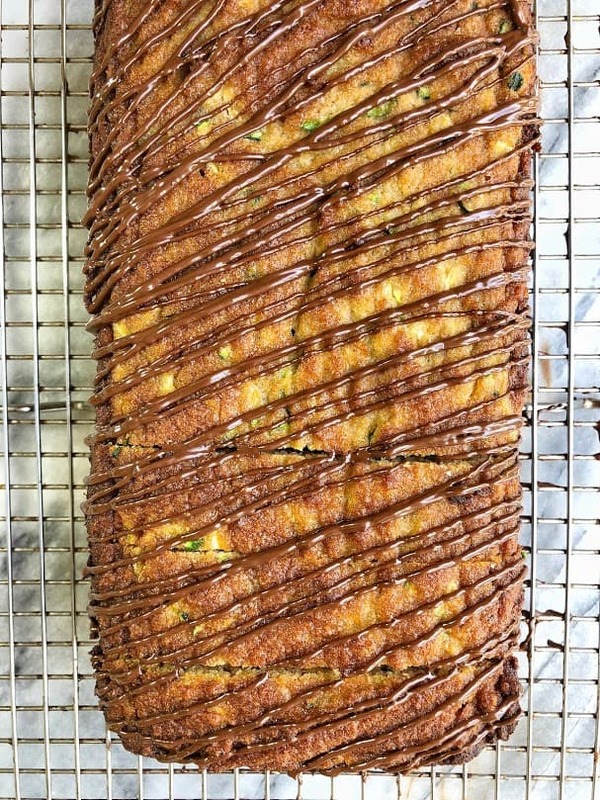 I’ve seen so many people on Instagram post about how their gardens are producing MASSIVE zucchini this year, and I’m all like well hello come over and make zucchini bread! Last summer, I posted a Whole Wheat Zucchini Bread recipe, but I knew I wanted to create one that was paleo this year because I’ve really gotten into baking with grain free flours. It has been a challenge because if you don’t already know, paleo baking can be really difficult. The flours are a lot more dense and more wet, which can cause a lot of different reactions to happen in the oven, like the bread completely sinking in the middle, or being too moist. My best tips for these are to use extremely fine almond flour, and to use less liquid than you would for typical white or wheat flour baking. With that being said, I decided it was time to add a paleo zucchini bread to my recipe box, so I went into the kitchen with the goal of getting it on the first try and while I was pretty close, I ended up testing it three times (with minor alterations each time) and the final product was born! 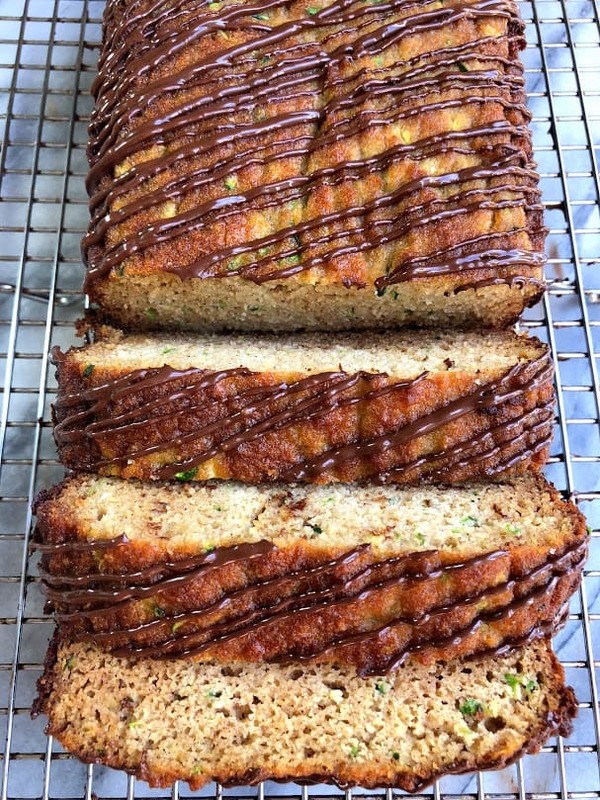 Can’t wait to see everyone whip up their best Paleo Zucchini Bread! 1 cup grated zucchini, squeezed dry to take out extra water. Preheat oven to 350F and prepare loaf pan with coconut oil or parchment paper. In a small bowl, mix together almond flour, coconut flour, salt, baking soda, cinnamon and nutmeg. In a large bowl, whisk 4 eggs. To the eggs, add in coconut oil, honey, and vanilla. Add the dry ingredients to the wet, careful not to over-stir. If you can insert a toothpick into the center and it comes out clean, you are ready to take it out. Let cool completely before cutting into.